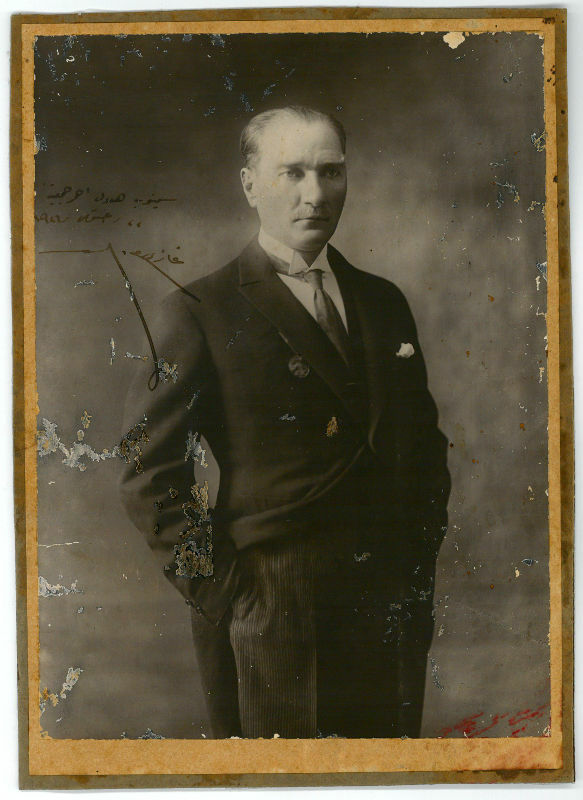 "Following the defeat of the Ottoman Empire in World War I, he led the Turkish National Movement in the Turkish War of Independence. 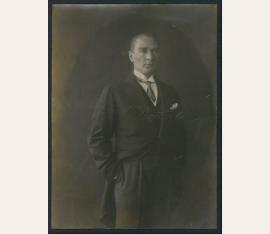 Having established a provisional government in Ankara, he defeated the forces sent by the Allies. 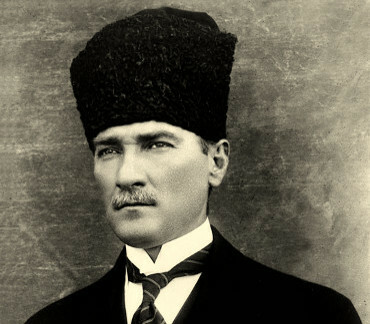 His military campaigns led to victory in the Turkish War of Independence. 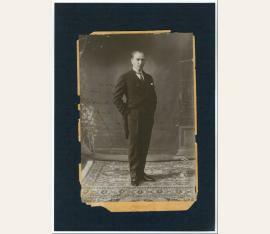 Atatürk then embarked upon a program of political, economic, and cultural reforms, seeking to transform the former Ottoman Empire into a modern and secular nation-state. 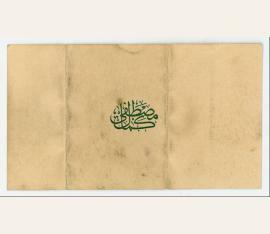 He is credited with being the founder of the Republic of Turkey. 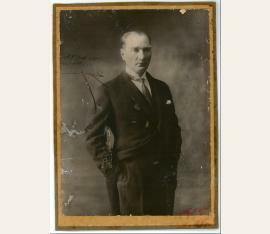 His surname, Atatürk (meaning ""Father of the Turks""), was granted to him in 1934 and forbidden to any other person by the Turkish parliament." Turkish army officer in the Ottoman military and first President of Turkey (1881-1938). Portrait signed and inscribed. N. p. 220:160 mm. Mounted on cardboard. An appealing knee-length portrait en face, dedicated to the Sinop Red Cross Society (Sinop Hilali Ahmer Cemiyeti). - Somewhat soiled; strongly corroded; some edge flaws. 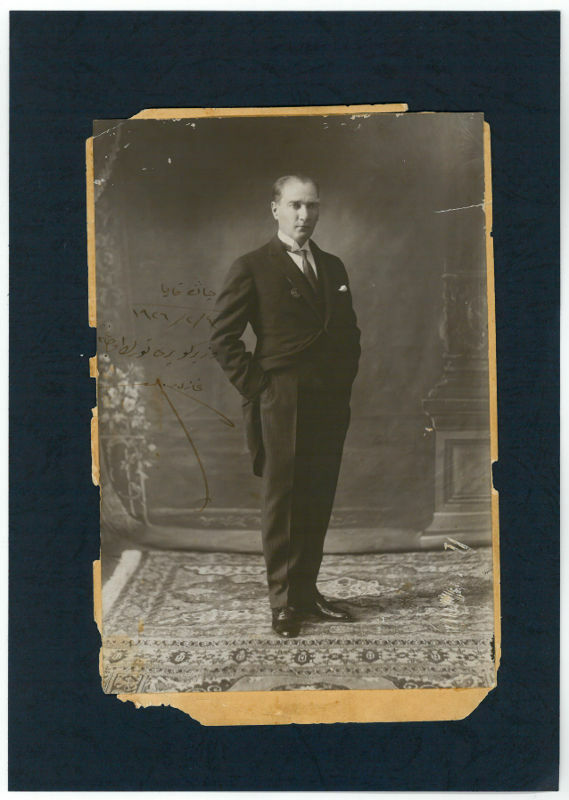 Turkish army officer in the Ottoman military and first President of Turkey (1881-1938). Portrait signed and inscribed. N. p. 218:149 mm. 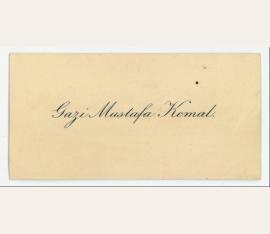 An appealing portrait in full height, inscribed to the Gankaya Vezirkòpru Turkish Power Society. - Slightly rubbed and minor damage to edges; largish tear (c. 2 cm) to upper right edge. 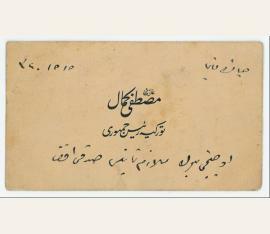 "Gazi Mustafa Kemal Türkiye Reisi Cumhuru" ("Gazi Mustafa Kemal President of Turkey", printed), presented to the army officer Sitki Efendi of the Third Corps.